Betelgeuse, one of the brightest stars in the sky, could burst into its supernova phase and become as bright as a full moon – and last for as long as a year. The massive star is visible in the winter sky over most of the world as a bright, reddish star, could explode as a supernova anytime within the next 100,000 years. The red giant, once so large it would reach out to Jupiter's orbit if placed in our own solar system, has shrunk by 15 percent over the past decade in a half, although it's just as bright as it's ever been. If Betelgeuse goes nova, it could offer Earth's astronomers an up close look at how supernovae evolve and the physics that governs how they work. The problem is that is is not clear when that will happen. While stories have been circulating that the star could explode in 2012, the odds of that are actually quite small. Betelgeuse may explode tomorrow night, or it may not go nova until the year 100,000 A.D. It's impossible to know. 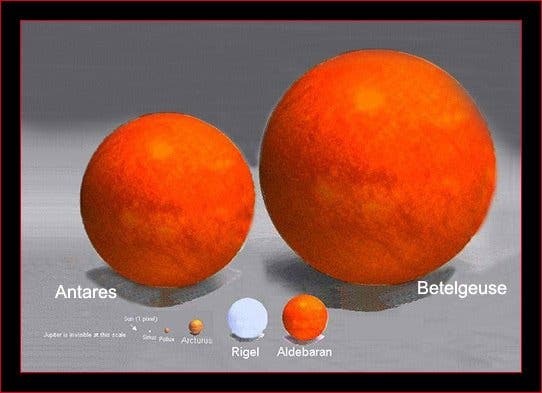 * Betelgeuse is beyond the death beam distance -somwhere within 30 light years range- where it could do ultimate damage to Earth.The explosion won't do the Earth any harm, as a star has to be relatively close — on the order of 25 light years — to do that. Betelgeuse is about 600 light years distant. Late in 2009 year astronomers witnessed the largest explosion ever recorded: a super giant star two hundred times bigger than the sun utterly obliterated by runaway thermonuclear reactions triggered by gamma ray-driven antimatter production. The resulting blast was visible for months because it unleashed a cloud of radioactive material over fifty times the size of our own star, giving off a nuclear fission glow visible from galaxies away. The entire star explodes. No neutron star, no black hole, nothing left behind but an expanding cloud of newly radioactive material and empty space where once was the most massive item you can actually have without ripping space. The explosion alone triggers alchemy on a suprasolar scale, converting stars' worth of matter into new radioactive elements. * And we saw this. This really happened. Someday, somewhere, another massive explosion will occur and no one will be left to tweet it. Image at top of page: Using different state-of-the-art techniques on ESO's Very Large Telescope, two independent teams of astronomers obtained the sharpest ever views of the supergiant star Betelgeuse. They show that the star has a vast plume of gas almost as large as our Solar System and a gigantic bubble boiling on its surface. These discoveries provide important clues to help explain how these mammoths shed material at such a tremendous rate.